With holiday parties in full swing, many people are staying busy and eating on the go or overindulging in sweet party treats. Gina Lundberg, MD, the clinical director of Emory Women’s Heart Center and assistant professor of medicine at Emory University School of Medicine answers questions from the general public on how to make smart food and drink decisions during the holidays. What are some entrée or side substitutions I can make without losing the "holiday" touch? Turkey and ham are both lean meat, so entrees aren’t usually the problem. The side dishes are usually where we run into trouble. 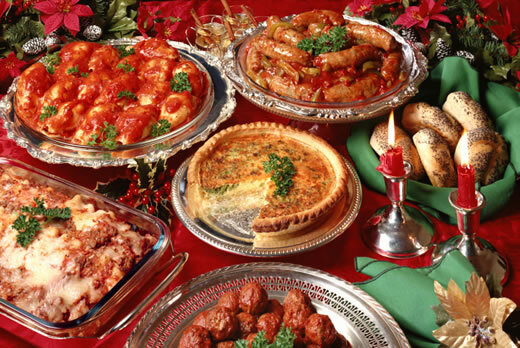 Feel free to have your ham, turkey, and even lean pork and beef, but try to avoid the potato-heavy, cheesy side dishes. Try to go heavier on green veggies instead. Veggies like broccoli and cauliflower make you feel full. Sweet potatoes are also great but try to avoid adding the marshmallows and extra sugar. I tend to eat a healthy plant based diet about 90 percent of the time so on the holidays I basically eat what I like. Is this strategy okay for someone like me? I do aerobic and strength training exercises about 120 minutes four times a week. We ask most women to do 150-180 minutes of cardio exercise per week, so you're doing great there! My concern regarding your diet would be that if you don't normally eat fatty foods, you might find yourself with an upset stomach that could disrupt your holidays! I would still try to make healthy choices and not go overboard. All things in moderation--a few bites of cheesecake won't ruin your healthy diet. Also, as you get older and your metabolism slows, it's going to get harder to recover from splurges like this. I try to drink 64 oz. of water a day (although it's a struggle to reach that through the holidays). Is that sufficient? Yes, for most people, 64 ounces is plenty! If you exercise a lot or sweat excessively, you may need to drink a little more. On the other hand, if you have kidney failure or congestive heart failure, you may need to drink less (just consult your physician). Also, alcohol can be dehydrating, so if your holiday celebrations involve alcohol, you may want to drink more to remain hydrated. I crave sweets every day. What can I do to satisfy my cravings without reaching for the chocolate? The more sugar you eat, the more you crave sugar. If you stick to a diet that is higher in protein, you'll be more satisfied and won't crave sugar as much. Eating healthier snacks more frequently (fruit, veggies, raw nuts) will stop you from being hungry and eating the wrong things. You may have heard that dark chocolate is healthy for you. All you need for the benefit of dark chocolate is about the size of one Hershey's Kiss, so if you'd like to reward yourself with a few M&M's or the fun-size versions of candy bars instead of large ones, do that and limit yourself to one per day. Also, try things with natural sugar. Fruits like pineapple and peaches are very high in sugar, and dried fruit can also be very sweet. Are certain oils more "heart healthy" than others? Like olive vs. coconut? The healthiest oils are olive and canola oil. Coconut has more saturated fat and isn’t as healthy. Olive and canola oils work best for veggies, but may not be as good for baking. When baking, I would use spray oil like coconut or peanut oil, which taste better in baked dishes. One of the problems with people knowing olive oil is healthy is that people tend to consume too much. The Mediterranean Diet suggests 4 tablespoons of olive oil per person per day max. I’ve heard that most of the sodium we consume doesn’t actually come from salt. Is that true and how much sodium should I have each day? Sodium from salt shakers makes up only about 15 percent of our daily sodium intake. The other 85 percent is in the processed foods in our diet. Anything that comes in a box, a bag or a can is high in sodium for the preservative effect, and most restaurant food and all fast food is very high in sodium. Be aware of foods that are low in fat or sugar, because they often add extra salt to achieve flavor. The low sodium diet we recommend is called the DASH diet (Dietary Approaches to Stop Hypertension). Cook more of your fresh produce at home and use other seasonings to give your food flavor like lemon, pepper, garlic, cumin, tumeric, oregano, parsley etc. What's the benefit of nuts? I've always read they are a healthy snack, but they are so high in fat. The main benefits of nuts are Omega-3 fatty acids and the high level of protein they provide. The healthiest nuts are walnuts and almonds, followed by pecans and pistachios. Peanuts have the most fat. Here's the problem with snacking on nuts: The appropriate serving size is about 10 almonds, so they are easy to overeat. Be sure to limit yourself to just a handful. Adding almond slices to salads and veggies is a great way to add nuts into your diet. Dr. Oz recently said that brown rice is high in arsenic and that white rice is actually better for you. I love brown rice, but should I switch to using white rice? There is years of evidence that support the fact that brown rice is much healthier than white rice. There's not enough research about arsenic in rice for us to say for certain. Bottom line: Brown is healthier for you, but if you're concerned, dump the rice and eat quinoa instead!